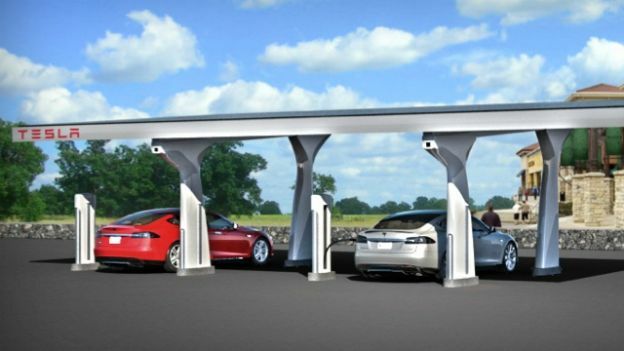 Tesla has expanded its UK network of Superchargers with the opening of six more stations. The electric car-maker has just opened three more stations in London, based in Canary Wharf, Tower Bridge and the Westfield White City shopping centre. That's on top of the capital's previous stations at Portman Square and the Royal Victoria Docks. For anyone wondering what Superchargers are, they are basically free charging stations for Tesla car owners. They can juice the Model S battery up to half in just 20 minutes, or rather a 170-mile range after 30 minutes. Tesla aims to complete the UK network enough within six months so drivers can travel across one end of the country to another using just Superchargers. This week Tesla also opened up a new showroom in the UK. Based in Birmingham, it's complete with a Model S design studio, four-bay service area and delivery bay. The car manufacturer also plans to open more showrooms in Manchester, Bristol, Newcastle and Edinburgh. If you're thinking of going electric and happen to have £70k spare, then check out T3's Tesla Model S review.